The weather's been a bit funky lately getting all warmed up and then suddenly deciding it wants to unload a torrent of rain upon the Korean peninsula. While rainy weather back in the States might call for some soup one dish Koreans go for is fried savory pancake-like dishes called "jeon" (전). Jeon is a savory pancake which usually incorporates vegetables, meat, seafood in a savory batter. Why do Koreans eat jeon when it rains? In the big traditional marketplaces there are long-running stalls which hold these big, black, flat cooking griddles. After heating up the oil, the ajummas will take their mix or battered foods and place it on the hot surface which then makes a "sssssssssssssssssssssssssssssss" sound. To Koreans, the sound sounds similar to rain hitting the ground and pavement. When I first heard this explanation, I thought the folks here were pulling my leg. Not only did I not hear the similarities but I'd never heard of people eating a certain food because the sound it made during the cooking process reminded them of the sounds of nature. What would people eat when it's blustery outside? What about if there's lightning? Note: As any tempura expert will tell you, ice cold water is one of the secrets to a very crisp fry as the cold water makes the batter develop gluten slower. Less gluten in frying = light and crisp fry. More gluten = sticky and doughy batter. You can even put in a little less water and add 1 or 2 ice cubes to keep the batter cold if you wish but be careful with the hot oil! Note: An alternative method of preparing and cooking this dish is to add the vegetables and seafood to the batter but set aside the chopped green onions. Instead, after initially placing batter on your heated pan, take a handful of the green onions and place them into the batter on the top side before spooning the beaten egg on top. This gives you a bit more control in how to place the green onions and will give the green onions a slightly more aesthetically pleasant "char"
Also, this dish is fine on its own but it's abso-freaking-lutely delightful with a chilled bottle of makgeolli (rice wine). Obviously, makgeolli may be a little bit more difficult for you to obtain if you're outside of Korea. And, as any makgeolli expert knows, makgeolli, like wine, comes in a vast variety of taste and texture. If you have the luxury of options, I'd go with a more bubbly and slightly sweet makgeolli to cut down on the oiliness of the jeon. 1. Mix all the ingredients together in a bowl and serve with the jeon. It helps if you make this sauce before the making the jeon. 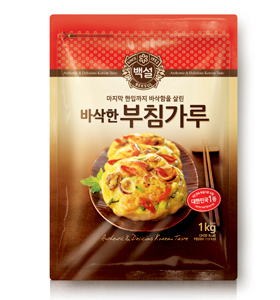 While this is more or less the traditional haemul pajeon. You can substitute the green onions for chives and do the same thing. This is called boochoo jeon (부추전). Also, I've tried a delightful twist on this dish in which a bit of curry powder was added to give it a different note. If you're a fan of curry and you got some curry powder on hand, give it a try!